The New Zealand Emissions Trading Scheme Review discussion document includes this statement about surplus emission units on page 10. This stockpile of banked NZUs amounts to around 140 million units. 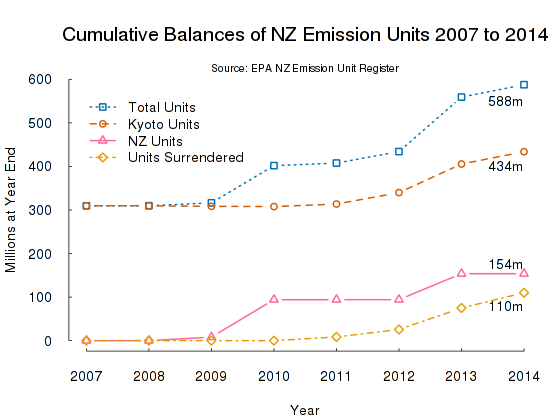 This is several times the total number of units surrendered under current NZ ETS settings each year, which typically amounts to less than 30 million units. Some of these units are held by foresters, who banked the NZUs they received as their trees grew. Other participants banked units they received via one-off allocations when the NZ ETS was first put in place, or accumulated NZUs by surrendering cheaper international units to meet their obligations and banking NZUs they purchased or received from the Government". Did you notice the specific use of language? The word 'surplus' is not used. The preferred term is 'banked NZUs owned by market participants'. 'Banked units' implies that it's the fault of the market participants. Surplus units implies faulty design. As I have posted previously. An effective emissions trading scheme with a real cap would never have surplus units. Units would be scarce and realistically priced. A surplus of units is of itself evidence of a failed implementation of cap and trade frameworks such as Kyoto and the EU ETS. How many surplus units are there? The discussion document says 140 million units. I have doodled away with the R programme and some data from the Environmental Protection Authority's Emissions Units Register and have made a graph of the cumulative total of units held in the NZ Emissions Unit Register at the end of the calendar year, up to 2014. The key point being that the cumulative total of all types of units, 588 million, at the end of 2014, exceeds the total 'compliance demand', 110 million, the number surrendered by emitters/ market participants from 2009 to 2014 by a factor of almost six. We need to note that in the final accounting for the 2008 to 2012 Kyoto Protocol commitment period, New Zealand has to cancel some 373 million units to match our emissions. Here is the R script.